« Join the “Tow Your Tots” Bike Ride this Monday! Get your tickets for the Latah Trail Foundation Dinner & Auction! May 19, 6:00pm, ON THE MOVE! 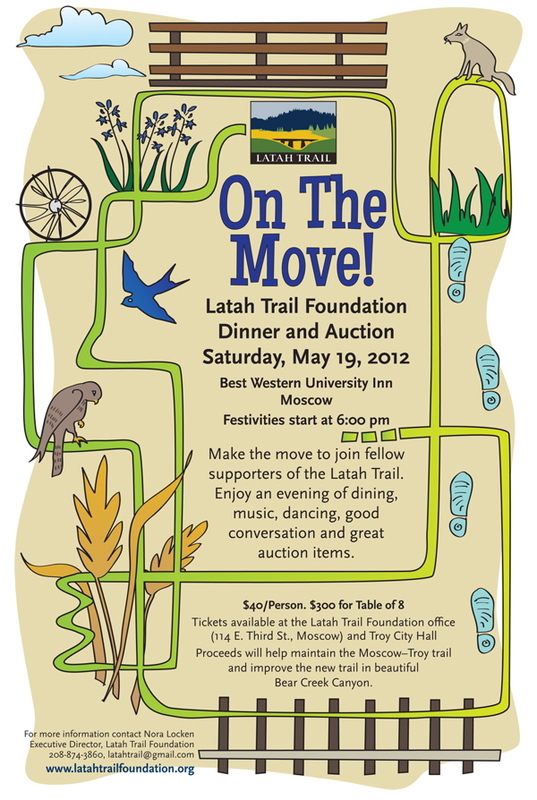 LATAH TRAIL FOUNDATION DINNER & AUCTION, Best Western University Inn. Make the move to join fellow supporters of the Latah Trail. Enjoy an evening of dining, music, dancing, good conversation and great auction items. This fun event is held every other year and serves as the Latah Trail Foundation‘s largest fundraiser. Ticket sales close on May 17th! If you would like to reserve a spot please contact Nora at latahtrail@gmail.com or 208.874.3860. You can also pick up tickets at BookPeople of Moscow and Troy City Hall. Tickets are $40 each or $300 for a table of 8.